Welcome back. You have been missed. I went badger watching last night and saw a badger for the first time in a long time. You know you miss that adrenaline rush when a suddenly a black and white face appears in the gloaming. Nice to see you back again BWM. 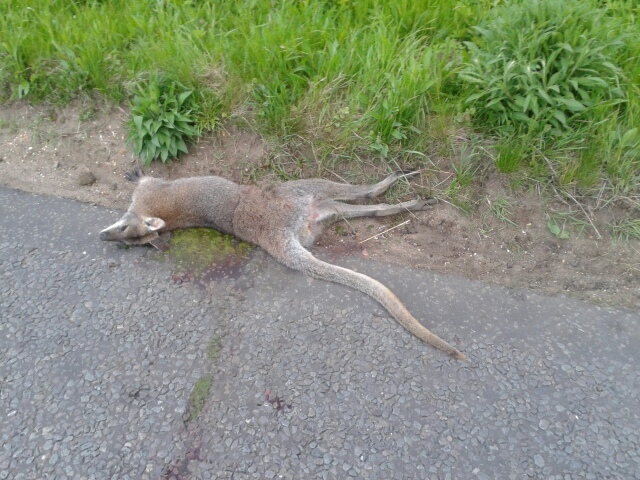 I was begining to think you had befallen the same fate as the Wallaby! There was until recently a colony of Bennets Red necked Wallaby near where I live in the Peak District. Back in the 70s when the colony was at its peak, a few got run over on the roads nearby. Its believed they are all gone now though, having escaped from a private zoo during the second world war. I saw a wallaby hopping across the road yesterday in Bedforshire. I thought I was going mad….it would seem, not yet! Hi I’ve just seen this thread after a quick google of Kangaroo in Woburn.. As tonight while out on my mountain bike through the woods I came across a live Kangaroo walking along a path way..
I’ve uncovered a handful of other sighting reports of wallabies in the area, so it seems that they’re out there. I’d love to see one myself, but no luck yet, despite many, many hours of walking and driving around. I think you can count yourself privileged!